So now that the G20 dust has settled and the media circus has dispersed, did the representatives of two-thirds of the global population make any meaningful decisions in St Petersburg? The final St Petersburg G20 Leaders Declaration has 11 paragraphs devoted to corruption efforts. 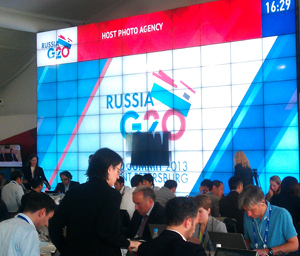 This greater visibility is welcome progress from the two sentences included in the 2011 Cannes G20 Communiqué. But do more words result in more action? Renewed emphasis on tackling money laundering and a proposed alliance for fighting corruption in mass sporting events were two positives coming out of this year’s G20. First, there is renewed emphasis in the Leaders Declaration on addressing money laundering. The commitments to “tackle the risks raised by opacity of legal persons and legal arrangements” are not as strong as we have called for. The need to crack down on corrupt and illegal activity facilitated by shell companies does gain greater visibility though with several references throughout the declaration, within the tax annex to the leaders declaration, and in the Anti-Corruption Working Group progress report. It will be hard to roll back this momentum in future summits. Second, a denial of entry network of contact points in all G20 countries has been established “in order to deny entry to our countries by corrupt officials and those who corrupt them”. The details and frameworks for this will be elaborated on early next year, but it’s an important step forward to crack down on impunity. Third, plans are afoot for a new Global Alliance for Integrity in Sports to tackle corruption in mass sporting events. In its future form we hope that it will draw from one of our recommendations made to the G20 earlier this year by “encouraging good governance in sport as well as closer working relationships with and between anti-fraud organisations, law enforcement and global sporting entities”. Fourth, a major success of the summit was the formal adoption of a new and time-bound Organisation for Economic Cooperation and Development (OECD) tax transparency plan building from growing momentum within the G8. Leaders have committed to “a more ambitious, more efficient and higher standard”, which requires G20 countries to automatically share financial information to crack down on tax evasion before the end of 2015. Fifth, in line with our calls in Transparency International’s Ideal G20 Communiqué issued before the summit, the G20 declaration underpins that anti-corruption authorities must “operate independently, with adequate resources and free from external influence”. This backing will certainly come as useful ammunition for some of our chapters during talks with governments about promoting these core elements. Finally, particular mention was made of the role that civil society has to play in national efforts and in this year’s G20 process. Leaders said they “recognise that a culture of intolerance towards corruption will only be achieved if we work in partnership with business and civil society”. This sentence is not to be taken lightly, especially when one considers the challenges faced by civil society in Russia this year. So what was the biggest disappointment? In a press conference, I asked whether the G20 leaders intended to build from the progress seen in the EU this year on extractives industry transparency with the adoption of new rules requiring oil, gas, mining and logging companies to disclose what they pay to governments around the world on a country-by-country basis. The response was disappointing: no, it was not discussed in any depth, and it was an issue that the G8 was dealing with since some G20 countries were uncomfortable with it. Transparency International believes it is more than the job of eight nations to work on enhancing extractives industry transparency, not least since major players in this sector – including next year’s G20 hosts, Australia – are neither in the G8, nor covered by the EU legislation. Now that the fanfare has faded, it is time for these commitments to be given life on a national level – and it is up to us to ensure governments realise we will hold them accountable for the pledges they make in international venues far from their citizens, the people who stand to win or lose most.